KNOW YOUR TECH breaks down the scientific technology used in your favorite sneakers and activewear. 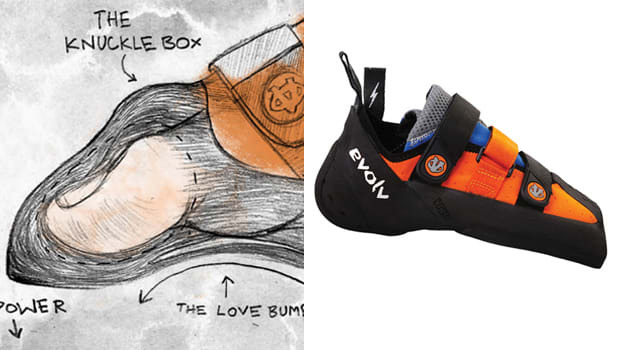 Let’s demystify your next purchase: today’s technology is the "Love Bump" and "Knuckle Box" technologies found in Evolv climbing shoes. When attempting to go rock climbing or bouldering, athletes need to have as much foot control as possible, particularly in the toe area. Evolv&apos;s "Knuckle Box" and "Love Bump" technologies work together to force your toes into a power position, while still maintaining an even level of comfort. What is it? "Knuckle Box" is a slightly oversized, down-turned toe box that is designed to allow your toes to move more freely, and allows the big toe to remain in its naturally curled position without being obstructed. The "Love Bump" compliments the "Knuckle Box" by filling in the dead space under your toes and adding more energy towards the surface. How does it work? Both features combine to make sort of a beak-shaped climbing platform that is supportive, and also versatile enough for some of the toughest climbing situations. Notable products: These two technologies are featured in the Evolv Shaman--which just so happens to be the best climbing/bouldering shoe available today. Bottom line: The "Knuckle Box" and "Love Bump" have revolutionized the way climbing footwear is designed, enhancing both performance and functionality.